Known to the local inhabitants of the region for centuries, the majestic natural wonder of the Victoria Falls was first brought to the attention of the wider world by the famous Scottish missionary and explorer Dr David Livingstone in 1855. On the 4th August 1851, on his first journey north into the unmapped interior, Livingstone arrived on the banks of a large river which local inhabitants called the Liambai, and which he correctly identified as the upper reaches of the Zambezi, known only to Europeans by its lower stretches and great delta on the east coast. Livingstone befriended the Makalolo chief, Sebetwane, who had established power in the region, noting that some of the Makalolo wore European cloth, no doubt traded with slave traders or their intermediaries. Livingstone and his travelling companion William Oswell were told of a great waterfall some distance downstream, although they did not travel to visit them. The Makalolo knew the Falls as Mosi-oa-Tunya, which Livingstone roughly translated as ‘Smoke that Sounds’ (and today is commonly adapted as ‘Smoke that Thunders’). Oswell marked their rough location on a map published in 1852, but it was not until 1855, when Livingstone returned to the Zambezi that he saw their grandeur for himself. It was not until 1855 that Livingstone returned to the Zambezi and finally explored downstream, escorted by Sebetwane’s successor, Chief Sekeletu. Travelling by canoe and then along the north bank to avoid the Katambora Rapids. Livingstone records visiting Kali Island whilst travelling downstream to the Falls in 1855, seeing the graves of the ancestors of the Sekute chiefs. He describes the graves over-arched by elephant tusks set into the earth, as well as finding human skulls on poles at the old chief's derelict palace. "Having descended about ten miles, we came to the island of Nampene, at the beginning of the rapids, where we were obliged to leave the canoes and proceed along the banks on foot. The next evening we slept opposite the island of Chondo, and, then crossing the Lekone or Lekwine, early the following morning were at the island of Sekote, called Kalai. Sekeletu arranged a canoe and local boatman to take Livingstone the final distance downstream to the waterfall. "Musioatunya bears SSE from Sekota islet after 20 minutes sail thence on 16th November, 1855, saw three or five large columns of vapour rising 100 or more feet"
This last passage has often been misquoted in reference to the Falls themselves, but it was the stretches of the river upstream of the Falls which first fired Livingstone’s imagination. Of the Falls themselves he would later write it “is a rather hopeless task to endeavour to convey an idea of it in words” (Livingstone and Livingstone, 1865). 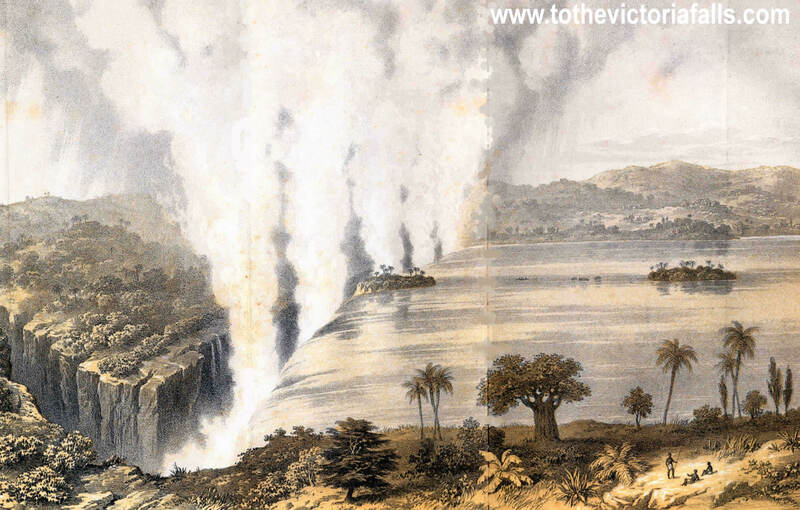 On 16th November 1855 Livingstone was guided to a small island on the very lip of the Falls. The Victoria Falls of the Zambesi River (from Livingstone's Missionary Travels 1857) This etching was commissioned by the publisher from an artist in London, who having never seen the Falls relied on Livingstone's written descriptions to detail the scene. Livingstone noted in the text that "The artist has a good idea of the scene, but, by way of explanation, he has shown more of the depth of the fissure than is visible, except by going close to the edge"
Livingstone's estimates of the length and width of the gorge are gross under-estimates - he added "Whoever may come after me will not, I trust, have reason to say I have indulged in exaggeration." Livingstone returned to the island the following day, in the company of Sekeletu, who had not seen the Falls before. On the island Livingstone planted a number of peach and apricot stones and some coffee seeds. He arranged for one of the boatmen to return and make a fence to protect the plants from the wanderings of hippopotami, hoping that the eternal spray from the Falls would nourish the small garden. In an uncharacteristic act of vanity Livingstone also cut his initials and date into the bark of a tree on the island, which he called Garden Island (now commonly known as Livingstone Island). Baldwin, the second European to visit the Falls and who was still there when Livingstone returned for his second visit in 1860, recorded "the Doctor tells me that it is the only place, from the West Coast to the East, where he had the vanity to cut his initials." On his explorations Livingstone carefully recorded local names for geographic landmarks. Here, however, he also named them in English - the Victoria Falls - in honour of his monarch, the reigning British Queen Victoria. Livingstone continued his epic journey following the Zambezi downstream to the east coast, completing a 3,000 mile (4,828 km) trek from the west to east coasts of the continent in the process. Returning to England Livingstone’s accounts of his African travels caught the imagination of Victorian Britain. His first book, ‘Missionary Travels and Researches in South Africa’ was published in 1857 and became an instant best-seller. Livingstone was awarded the Gold Medal of the Royal Geographical Society of London for his explorations and scientific observations. It is accepted that stories of the existence of the falls had reached European settlers in the south some 15 years before Livingstone first set eyes on them, and there has been much debate on if Livingstone actually was the first European to visit Falls. He concludes that Livingstone was the first European to see the Falls, and as he himself was one of the early visitors, having visited the Falls in November 1869, his contemporary record is significant. Numerous authors have addressed the issue, and in particular the claims including Karel Trichardt in 1838, Jan Viljoen, Erasmus Jacobs and Engelbrecht Viljoen, 1851 and W H Pretorius and Stoffel Snyman in 1855. In the build up to the 100th and 150th anniversaries of Livingstone’s discovery, there was much debate on the exact date of Livingstone's discovery of the Falls. Over the years there has been much confusion over this date. "The date of the discovery of the Victoria Falls is frequently miss-stated. A common error is to assign it to November 5th, 1855. But the evidence of Livingstone's writings points to the date given in the Encyclopaedia Britannica, namely November 17th, 1855." 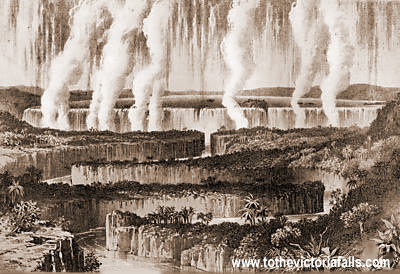 According to the chronology set out in ‘Missionary Travels’, Livingstone states quite clearly that he left the Victoria Falls on the 20th of November after taking two days to explore the Falls themselves, giving a date of arrival of the 18th. However, on completing his journey across the continent and arrival at Quilimane (Mozambique) he found it was four days later than he reckoned, drawing into doubt the whole chronology of his journey. The debate over the date is thought to been laid to rest on the centenary when Mr P C G Adams (London Missionary Society) had unearthed correspondence from Livingstone stating that he was certain that the date on which he actually first viewed the Falls was the 16th November. After discovering the Falls Livingstone continued downstream, travelling on the north bank of the river. He met the Batoka people and was startled by their tradition of removing the front teeth at puberty, considering front teeth to be ugly. The reason the Batoka told him was that "they wished to look like oxen, and not like zebras". "Hundreds of buffaloes and zebras grazed on the open spaces, and beneath the trees stood lordly elephants feeding majestically. The number of animals was quite astonishing. I wished I could have photographed a scene so seldom beheld, and which is destined, as guns increase, to pass away from Earth." Passing through another modern national park, the Lower Zambezi National Park, he reached the Luangwa river as it joined the Zambezi, and the present-day town of Feira, thanking God "for His great mercies in helping us thus far". Here he discovered the remains of a stone church, a broken bell with the letters IHS and a cross, but no date. Across the Luangwa at Zumbo were several ruined houses, and he concluded they belonged to Portuguese missionaries or slavers. Downriver from the confluence of the Luangwa River Livingstone and party encountered Chief Mpende and his people. The missionary roasted an ox and sent a hind leg to the chief. Mpende responded with friendship, saying a Mozunga (Portuguese), his enemy, would never have done such a thing. "All the slaves of Tete are our children," he told Livingstone. "The Bazunga have made a town at our expense". The chief lent them canoes to cross to the south bank, cutting out a large bend in the river. Thus, by diverting from the coarse of the river Livingstone failed to appreciate one of its defining features - the Cahora Bassa rapids. He also nearly missed one of the Zambezi's major tributaries, the Shire, but records being told in Tete of a river which, it was said, drained a great lake, the 'Nyanja'. From Tete Livingstone journeyed on down the river past Senna to the Zambezi Delta, then northeast to Quelimane on the Indian Ocean coast, which he reached in May 1856. Leaving behind his Makololo companions, he caught a sailing ship to Mauritius, then hitched a ride home to England on the Peninsular and Oriental Steam Ship Company vessel Candia. Livingstone returned to his family in England in 1856, receiving a hero's welcome. He actively promoted himself and his discoveries, attracting huge crowds wherever he spoke and being mobbed in public. By the mid-nineteenth century the development of industrial printing fed a growing market in newspapers, magazines, journals, books, bringing the exploits of explorers to a Victorian public hungry for adventure. Within months of his return he secured a deal to publish his journals with a leading geographical publisher, John Murray of London. In fact Livingstone's friend and supporter, Roderick Murchison, President of the Royal Geographical Society, had already set up the deal before Livingstone had even set foot back on British soil. In 1857 his book, Missionary Travels and Researches in Southern Africa, was finally published to an eager public and became an instant best-seller, along with his six month speaking tour. Livingstone dedicated it to Murchison and for "the kind interest he has always taken in the Author's pursuits and welfare". The first edition of 12,000 copies sold out immediately despite its price tag of one guinea. To cope with the demand, the publisher Murray ordered the printing of another 8,000 copies of the 689 page volume. By the beginning of December this run too had sold out and Murray sent another 5,000 to the presses. "I think I would rather cross the African continent again than undertake to write about it. I intended on going to Africa to continue my studies; but... I entailed on myself, in addition to teaching, manual labor in building and other handicraft work, which made me generally as much exhausted and unfit for study in the evenings as ever I had been when a cotton-spinner. The want of time for self-improvement was the only source of regret that I experienced during my African career." Livingstone, David (1857), Missionary Travels and Researches in Southern Africa, London.